I got a little lazy taking this picture, so sorry it's a little dark! But the meal itself was certainly bright and happy. 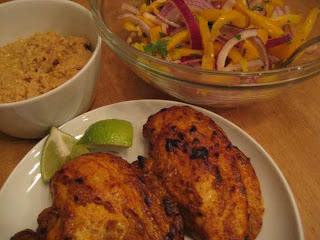 I saw the recipes for Tandoori Chicken with Mashed Chick Peas and Pepper and Onion Salad on an episode of 30 Minute Meals called The Lighter Side. The recipe as very easy to cut in half if there are just two of you. Usually, when I cut a recipe in half I still make the whole recipe for the sauce since someone in my house tends to like his dinner with more sauce than the average bear. I think this recipe is also a great example of how you can mix it up a little with your chicken dishes. It's so easy to have chicken and rice every night, so why not go a little nuts and have your chicken with chickpeas, pita bread, and an pepper and onion salad? My husband would have been happy without the mashed chickpeas, but I liked putting them in my pita with the chicken and salad. Faith - I'm telling you, you gotta try it! Whole foods is right. Yogurt cheese (or YoChee) is a wonderful versatile ingredient you can make at home from your yogurt. It has substantial nutritional benefits ( a creamy food which is low or no fat plus high protein and calcium). You might want to take a look at,” Eat Well the YoChee Way” a guide and cookbook to this important food. It really expands the use of yogurt cheese to desserts, main courses and much more. Also nutritional content. Also, the website YoChee.com contains a free yogurt cheese how- to slide show, nutrition information and free recipes. I think Whole Foods wasn't recommending yogurt cheese. I think they were recommending using regular yogurt, but straining it through cheesecloth. It is confusing :Straining yogurt is oddly called "yogurt cheese" even though it is not a cheese. (That is why we call it "YoChee" in our book.) You can also buy store bought more traditonal cheeses called yogurt cheese. YoChee is a terrific ingredient and we recommend that those concerned with a tasty healthy diet look into it. Thanks for the clarification, Nikki!